Several years into the app economy, business has changed. Accelerating product cycles and competitive threats now demand continuous planning. Change is constant and managing it is more important than ever. As a result, companies that for years have taken a traditional approach to managing initiatives are moving rapidly to implement agile business practices. And they’re seeing results, in the form of improved quality, faster delivery of value, reduced development costs and increased customer satisfaction. But this transition also creates new challenges and responsibilities for the project management office (PMO). 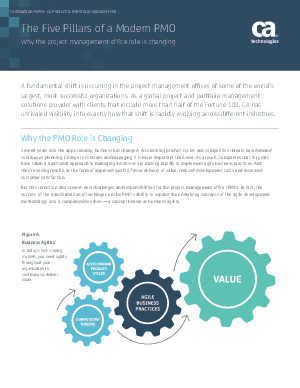 In fact, the success of the transformation often hinges on the PMO’s ability to expand the underlying concepts of the agile development methodology into a companywide ethos¬—a concept known as business agility.